We are known internationally that our mattresses are made to measure in the highest quality and care handmade by us. This unique feature of the special mattress design for the nautical area has already been tested to the fullest satisfaction of many of our customers. Our custom mattresses can now be found all over the world in many sleeping places on ships, yachts and boats. Especially in the maritime area, custom-made mattresses are in high demand. Material In the injection molding process, high tech synthetic materials (no plasticizers) are used to create the FLEXIMA® spring elements. ECO-friendly The prolonged durability and sustainability of our product in comparison to conventional yacht cushions helps to counteract rising waste levels. Hygiene Humid mattresses foster bacteria and mold. 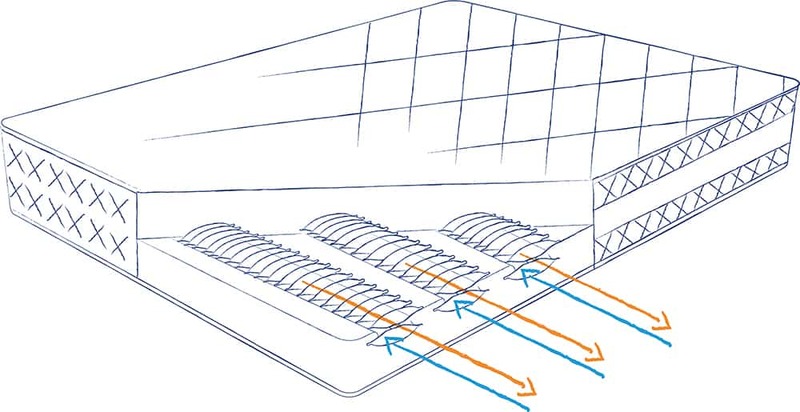 Therefore, FLEXIMA® mattresses have ventilation cavities to keep them dry. Flexible The FLEXIMA® system comes in various heights, degrees of firmness to fit any requirement. The FLEXIMA mattresses made to measure offer a very comfortable sleep and promote the important so-called “healthy sleep”. Thus, the stay on the water in bed is a particularly relaxing experience. Numerous quality features such as the particularly environmentally friendly mattress material as well as the perfect hygienic standards also ensure a wonderfully secure feeling when sleeping. Every FLEXIMA mattress on measure breathes with you! In the development of our custom mattresses, we have made use of a special natural sleeping feature: until the so-called deep sleep phase is reached, man moves countless times in his bed. With each of these movements you press damp and warm air out of the mattress core with our mattresses. With this you can create your own couch microclimate in bed with our mattresses made to measure and moisture will not stand a chance of lasting! By the way: our custom-made mattresses are also tailor-made for your home or caravan!